This entry was posted on August 24, 2009 at 12:13 pm and is filed under Iowa, Okoboji. You can follow any responses to this entry through the RSS 2.0 feed. You can skip to the end and leave a response. Pinging is currently not allowed. It still says August 21. I wondered if the group eating at the table included you and Bill. Well, poo! It is fun to watch as the webcam refreshes, and to check out the view periodically. I want to see what the view is like in the winter. I had seen this webcam site a couple of weeks ago. At that time it refreshed every ten seconds. Tonight I emailed the “contact” for the sponsoring company and asked if anyone there knew the image was not refreshing. Hopefully it will get fixed soon. Bill and I are not pictured. 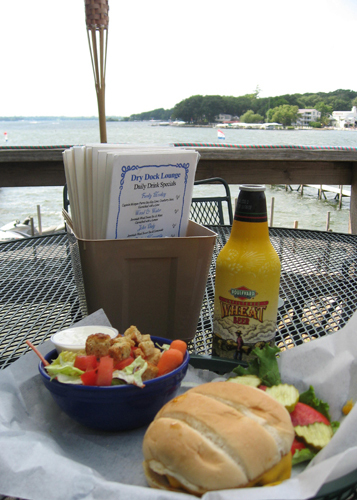 However, the Dry Dock Lounge has gotten to be our favorite Okoboji lakeside patio restaurant (plus we eat inside sometimes, too). Our favorite in that category used to the the Ritz, but the clientele there repeatedly was too potty mouthy for our taste (no pun intended! ).